Habitat: Temperate regions of the Northern Hemisphere. Description: Common Hop is a perennial, herbaceous plant. The leaves are heart-shaped and lobed, oppositely arranged along the stem. They are dark-green and finely toothed. Flowers spring from the axils of the leaves. The female flowers are in leafy cone-like catkins, pale green in color. Male flowers are small and greenish yellow. Flowering occurs from July to August. 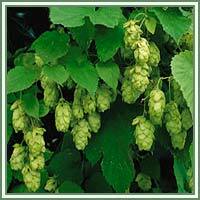 Medicinal use: Hops is most commonly used for its sedative properties. Hop tea is used in treatments of nervous diarrhea, insomnia, and various nervous system disorders. It is also considered helpful for appetite stimulation, cramps, flatulence, and digestion enhancement. 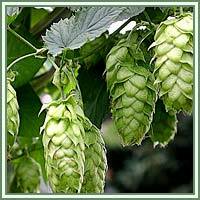 Common Hop is also useful in treatment of problems with urinary complaints.